I found this note stuck on the inside cover of Running in Heels, by Anna Maxted. I’m convinced its good luck because the lady only charged me 50 cents for the 23 books I picked out. Oh, and there really were crumbs inside, or maybe it was sand from the beach. Yes, but of course. 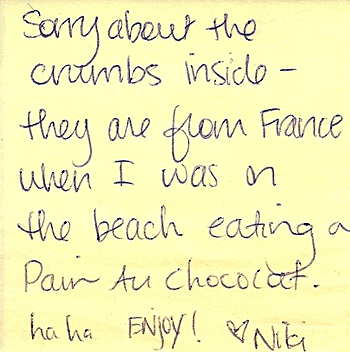 Just because they’re allegedly from France and more importantly they’re YOURS they’re not just ANY ol’ run-of-the-mill left-over crumbs, ohhhh nooo, they are just *so* special! Just like…..you!